20 Litres / 5.3 US gal. It's called classic for a reason: it draws on styling cues from days when everybody who was anybody had a muscle car, 8-tracks pumped out the tunes and a low-slung motorcycle turned heads. 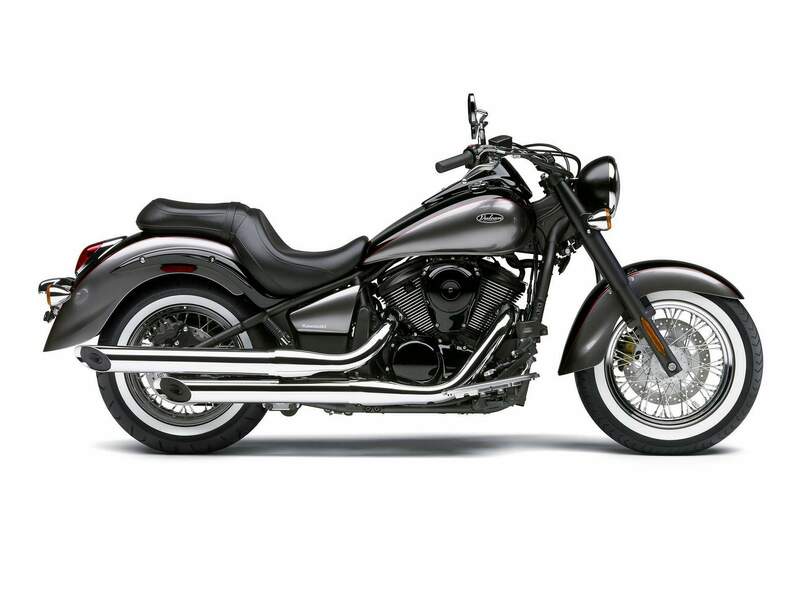 The Vulcan® 900 Classic is definitely the bike to get noticed on, with its spoke wheels, low-slung seat and chrome dual slash-cut mufflers. And for those looking for an even more distinctive look, the Vulcan 900 Classic Special Edition exudes badass with a new for 2012 blackout treatment on the forks, fender struts, air cover, engine covers and cases and cylinders and valve covers. A beautiful Pearl Meteor Gray / Polar White paint job is enhanced by a checkered flag pinstripe. Completing the Special Edition look are chrome pipes and whitewall tires, for the ultimate in retro flair. It’s powered by a 903cc engine, just like its 900 Vulcan brethren. This powerplant offers excellent performance and smooth roll-on acceleration. Rider floorboards complete with a heel and toe shifter enhance rider comfort. The tank-mounted instrumentation includes a handy fuel gauge and an easy-to-read analog speedometer. And its 5.3-gallon fuel tank is the largest in its class. The visual treats continue with curved cooling fins on the big, classic-looking V-twin, which bristles with modern touches inside including four-valve-per-cylinder performance and liquid-cooled reliability. An engine counterbalancer works with the single-pin crankshaft to produce that distinctive guttural V-twin sound and feel, but without the annoying V-twin vibration. Rugged and reliable belt final drive on the Vulcan 900 keeps the overall weight down, improves rear-end styling and provides the rider with additional customizing opportunities. Not to mention the largest rear tire in its class also contributes to the Vulcan 900’s big bike feel. The Vulcan 900’s low seat height and tapered seat do not discriminate against shorter riders. Comfortable enough for any distance, the front bucket seat flows nicely into the largest capacity fuel tank in its class, and the lower chassis rails provide a narrow shape for an abbreviated reach to the pavement – ideal for shorter riders. Meanwhile, the rear pillion pad makes it painless to share the two-wheeled experience. Wide handlebars, seat and floorboard layout offers an ideal ergonomic relationship, making for a relaxing mount. Some of the other features that make the Vulcan 900 appealing to such a wide audience are a fork offset and rake designed for light, effortless maneuvering at low, in-town speeds. The 900 Classic is equipped with an auto-fast idle system that uses an rpm feedback relay to help ensure a fixed engine speed in all starting conditions. Its easy-to-control fuel injection makes ultra-low-speed riding surprisingly easy, and the abundant low-rpm torque provides thrilling roll-on acceleration. At home, around town or on the open road, this motorcycle is built for hour upon hour of riding pleasure. The Vulcan 900 Classic takes its styling cues from its big brother, the Vulcan 2000 Classic. 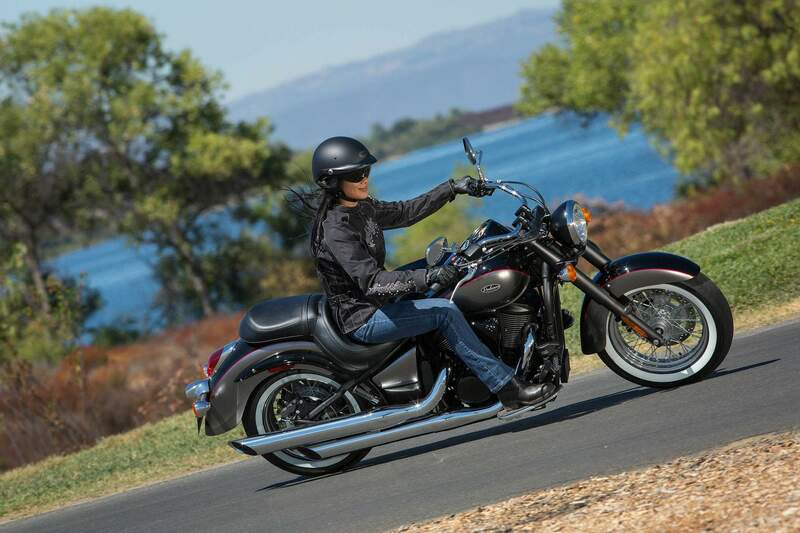 With long, low lines, seductively shaped bodywork, a low seat height and super-fat rear tyre, the Vulcan 900 has the presence of a much larger capacity cruiser combined with the rider-friendly handling traits you’d expect from a middleweight motorcycle. 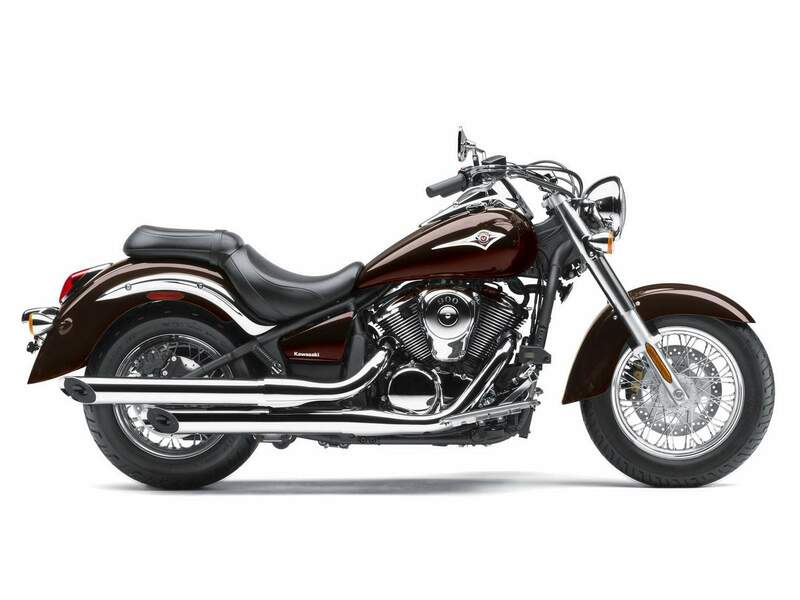 Just one glance and you’ll appreciate the high build quality and craftsmanship for which Kawasaki cruisers are famous. This truly is middleweight cruising at its finest. • New for 2012 Special Edition has blackout treatment on forks, rear fender struts, engine covers and cases, and cylinders and valve covers.